Haier with its history of futuristic products and innovative technology has been leading the market for more than a decade now. 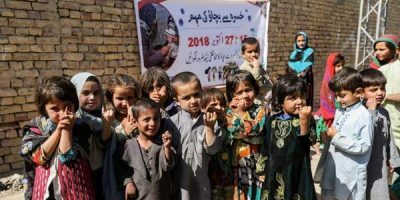 Its collaboration with Daraz was a massive success and has made 11.11 appear on the annual sales calendars for the years to come. Haier owes this success to its loyal consumers who have always been supportive. The 11.11 successful journey with Daraz, as a valuable partner only means there is still more to come. Haier broke records and got maximum hits on the online portal from midnight of the 10th November and onwards. People who know Haier, know that every product is the epitome of class and excellence. The products are of premium quality and always in demand. 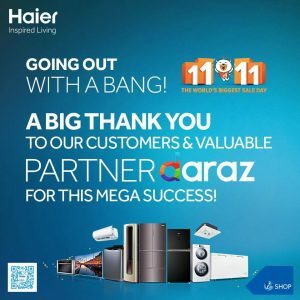 When the sale began, the general perception was that Haier products will be out of stock within a couple of hours because of the demand and the amazing deals.
. @HaierPakistan Has announced his winner of placing the very first order through #Daraz1111 …. Haier products have proven to always be ahead of time with its refrigerator series with Blue Turbo Cooling technology, 1-hour icing and smart touch panel. The LED TV has MiraCast which can help your mobile phones connect with your LED television. The Air Conditioners are revolutionized, the DC inverter is well in demand with its auto-cleaning technology making it easier to maintain. In addition to that the UPS technology helps keep you cool in times of power outage. The brands Washing Machines have never disappointed any consumer with the quality and class they offer every single time. One touch Washing Machine works like magic with just one touch. It not only washes all the clothes, but also makes the clothes stand out and feel like new with its Lint Filter and Pillow Drum. Every single threadin your clothes is kept fresh and new. Air Dry technology helps you dry you clothes in winter, leaving them fresh and fancy. The brands deep freezer can work for days without electricity and so you save not only energy but a lot of hassle as well. The sale was a success in every aspect for Haier home appliances. 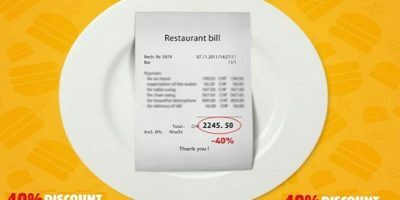 The brand proved its well in demand and still is way ahead of all its competitors.